RESEARCH: Predicting Genotypic Variation in Growth and Yield under Abiotic Stress through Biophysical Process Modeling. National Science Foundation, Plant Genome Research Project. With Brent Ewers (PI, Wyoming), Daniel Kliebenstein (UC Davis), C. Robertson McClung (Dartmouth), and Cynthia Weinig (Wyoming), September 1 2016 to August 31 2021. Rising demand for high quality food crops due to increasing world populations along with more likely temperature and drought stress requires further crop improvements from breeding programs. A major limitation to these programs is an understanding of how the genetic information affects the characteristics of plants that improve the amount of edible portions. Moreover, the predictive understanding is even less if the plants are placed in new, stressful environments like low rainfall or high temperature. A likely avenue of inquiry to improve breeding is to better connect how information stored in genes becomes traits of plants that combine their biology, such as photosynthetic rate or the amount of resources allocated to an edible root, with the physical world, such as the amount of water available or an excessive heat wave. These connections are currently often made in a way that requires new data collection for every new crop plant or environment such as a new soil, new temperature range or even a new improved line that shows variation in the amount of resources the plant allocates to an edible root. This continuous need for new information ultimately slows down the breeding program and the ability of plant scientists to quickly respond to the needs of society. This project will test a new approach that uses large amounts of data to calculate the probability that a particular plant characteristic will be displayed by a given plant line under various environmental conditions. Specifically, the project will measure plant performance continuously by sending electrical pulses through plants, integrating the data generated with large data sets that show which genes are active as well as the level of biologically relevant molecules that contribute to major metabolic pathways within the plants at any given time. This new approach requires high performance computing to test many times how the probability of phenotypic improvement in the crop may occur. These high performance computing approaches will become a core part of a modern, competitive workforce. In this regard, the project will provide workshops for high school teachers in the use of high performance yet open source computing tools in their classrooms. 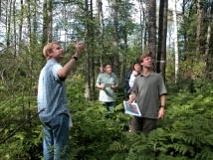 In addition, the project will develop experimental and computational modules in biological and quantitative learning for students in grades 6-12 using the highly successful Wisconsin FastPlants system (http://www.fastplants.org/). With increasing world populations, genetic advances to improve crop growth, yield and resistance to abiotic stress are a pressing need. Limiting the speed of crop improvement is a crucial knowledge gap regarding biophysical processes that modulate the relationship between the genome and phenome, hindering the ability to predict the phenotype of novel genotypes in novel environments. As a first step towards bridging this gap, a combination of high-throughput phenotyping and biophysical process modeling will incorporate allelic variation at key genes affecting plant carbon metabolism, hydraulics, and resource allocation, all of which are known to impact drought- and heat-stress resistance in plants. Variable selective pressures during crop diversification have caused extensive phenotypic variation among B. rapa crops, making it an excellent study system to both connect organ-level measures both down to the level of transcriptomic and metabolomic phenotypes and up to yield and to test predictive process models. Process models will be developed and refined using the mechanistic links that connect cell processes and ultimately whole plant physiology to regulatory intermediates such as metabolites and gene transcripts. If successful, the models developed will enable prediction of whole-plant stress-response phenotypes in heterogeneous genotypes and environments. The goals of the project are to: 1) deploy a novel high-throughput and real-time phenotyping method to measure diel physiological dynamics in eight B. rapa parental Nested Association Mapping (NAM) lines under drought- and heat-stress conditions; 2) predict yield in a Recombinant Inbred Line (RIL) population of B. rapa using a biophysical process model of carbon metabolism, hydraulics and resource allocation to test systems-level links between circadian, transcriptomic, metabolomic, and physiological QTL; and 3) test the predictive ability of the biophysical process model under heat- and drought-stress environments using the RIL population used in Aim 2. All data and resources generated in this project will be made accessible to the public through long-term open access repositories such as Project Github and the NCBI Short Read Archive. Collaborative research: Integrating plant hydraulics with climate and hydrology to understand and predict responses to climate change. National Science Foundation, Integrated Ecological Physiology program. With John Sperry (PI, Utah), Paul Brooks (Utah), and William Anderegg (Princeton). Project period: May 15, 2015 to April 30, 2018. Droughts threaten the health of the nation's forest resources by reducing tree growth and increasing mortality from multiple causes including fires and insect attack. This project will determine when and where forests are most at risk from drought-induced mortality in the western USA under current and future climate scenarios. Plant drought responses will be predicted from a theory of water supply and demand that is based on the physics of water flow. When plants are photosynthesizing they are also losing water by evaporation through the stomatal pores that take up CO2 in their leaves. The lost water is replenished by a passive wicking process that pulls water from the soil into roots and up dead, water-filled xylem tubes. Drought-induced failure of this water transport limits the possible rate of water supply, which by theory is associated with reduced water demand caused by closure of stomatal pores. Consequently, prolonged droughts reduce growth and transport capacity, creating persistent metabolic stresses that increase mortality by the "chronic stress hypothesis". A computer model will combine the supply-demand theory with climatic and landscape causes of drought stress, including precipitation, groundwater hydrology, and atmospheric humidity. The model and chronic stress hypothesis will be tested in greenhouse, plantation, and natural stands, focusing on trees of the intermountain west. Predictions for the region's forests will be made from climate projections. Forecasts will inform decisions on land management. Educational versions of the model will illustrate the combined roles of climate and groundwater hydrology on plant health. The project is a regionally focused trial of an approach that can be applied nationally and globally. A systems analysis of plant growth promotion by the rhizosphere microbiome. National Science Foundation, Plant Genome Research Program. With Cynthia Weinig (PI, Wyoming), Marc Brock and Brent Ewers (Wyoming), Lois Maignien (MBL), Mike Covington and Ian Korf (UC Davis). Project period: June 1, 2015 to May 31, 2020. Soil microorganisms serve a range of ecosystem services that promote plant growth under stressful abiotic conditions, including nitrogen limitation. Yet, soil microbial communities represent a largely untapped source for yield improvement in crop species. Analyzing plant gene expression (when different genes are turned on and off) and physiological responses to diverse soil micro-organisms will provide insights as to the mechanisms by which microbes enhance plant growth. Further, modeling of plant gene expression, hydraulic, and gas-exchange responses to the soil microbial environment can provide a predictive understanding of plant growth promotion by microbes under variable nitrogen (fertilizer) amendments. When grown with an intact vs. reduced set of soil microbes, crops of Brassica rapa upregulate gas-exchange and increase biomass accumulation up to two-fold, suggesting one physiological link between plant gene expression responses to soil microbes and eventual plant biomass accumulation. Because B. rapa is domesticated as root, leaf, and oilseed crops, mechanisms of growth promotion characterized in this species could translate to a range of other crops. Using sequencing of plant and soil microbe DNA and analyses of plant responses, the research will characterize mechanisms of plant growth promotion by soil microbes and test predictive systems models. Soil microbes reflect a biological continuum between the plant and the environment. While much is known about the identity and functions of plant species within natural and agricultural ecosystems, much less is known about biogeographic distributions, identity, and functions of beneficial rhizosphere microbes and their role in alleviating soil N stress. The current research fills these knowledge gaps. Further, modeling will provide predictive links from genomic, transcriptomic, and physiological features to plant growth promotion in response to beneficial soil microbes. We have developed an object-oriented ecosystem process model for application at leaf, organism, stand, and larger scales. 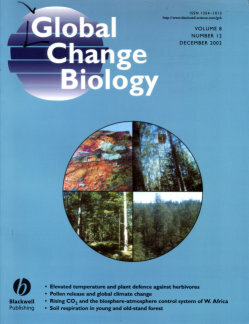 It is being used to understand coupled hydraulic and carbon uptake/utilization drivers of tree mortality, forest responses to disturbance such as bark beetles, effects of drought on water, carbon, and biogeochemical processes, and key processes for scaling to flux towers, watersheds, and regional scales. It is also being used along with Bayesian analysis to understand model/data complexity requirements, uncertainty analysis, and error propagation. Improving prediction of climate change impacts on wetland-rich landscapes: Testing model mechanisms with flux-data assimilation at multiple sites. Department of Energy, NICCR program. Prediction of climate change impacts on terrestrial carbon fluxes is highly uncertain. Upland ecosystem models, even when constrained with flux tower data, fail to explain interannual variability in CO2 fluxes in the upper Midwest. One possible reason is lack of model mechanisms for wetland biogeochemistry and hydrology, where fluxes would be expected to vary with changes in depth to saturation. Wetlands are expected to be highly sensitive to climate change. We propose to develop a wetland-landscape model and assimilate long-term multiple flux tower observations to simulate wetland and upland mechanisms simultaneously, with evaluation against unassimilated flux observations. Model evaluation is typically limited to single sites and extrapolation of these results across larger regions is questionable. This research will improve understanding of carbon-rich forest-wetland landscape response to climatic change. Collaborative research: Restricted plasticity of canopy stomatal conductance: Conceptual basis for simplified models of canopy transpiration. National Science Foundation, Hydrologic Sciences Program. Measuring and modeling the source, transport and bioavailability of phosphorus in agricultural watersheds. Environmental Protection Agency, STAR program. We will measure and model the sources, transport, and fate of bioavailable phosphorus (BAP) in the mostly agricultural 604-km2 watershed of Lake Mendota near Madison, Wisconsin. This well-known eutrophic lake is impacted by phosphorus (P) loading from agricultural sources, including row crops, dairy operations, and land applications of manure and commercial fertilizers. The research will compliment an on-going nonpollution abatement program targeted at reducing P inputs to the lake through improved management of these agricultural sources. Our multidisciplinary team provides the expertise in social science, outreach, environmental modeling, environmental chemistry, hydrology and sediment transport, environmental engineering, and limnology – all of which are needed to accomplish our “systems” goals. Our focus is on the scale-dependent processes that link agricultural P sources to watershed export of BAP. Our plan involves six major objectives: 1) Quantification of the effects of manure management on runoff BAP; 2) Measurement of the amounts, spatial patterns, and transport of sediment and BAP in channels and streams acting as routes for transport through the watershed; 3) Quantification of the in-stream processes governing the fate and transport of sediment P; 4) Evaluation and improvement of modeling tools (APEX, SWAT) for assessing P transport over a wide range of spatial scales; 5) Determination of the relation of BAP losses to the scale of animal operations; and 6) Integrated outreach with stakeholders, agency partners and other researchers through farmer-feedback procedures, agency assessments and model refinement. Knowledge gained will be crucial for effective state and national TMDL development and implementation. ChEAS is a NSF-funded interdisciplinary research collaboration network project aimed at understanding land-atmosphere exchange of cabon, water, and energy at one of the tallest AmeriFlux towers, located near Park Falls, Wisconsin. The lead institution for the project is Penn. State University; Dr. Mackay is one of 6 members of the ChEAS steering committee. We are developing a general framework for the analysis of uncertainty in simulation models. Our approach is motivated by methods such as GLUE and Parato Optimality. 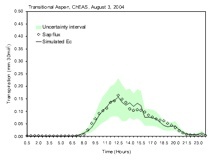 The premise of APReS is that parameter uncertainty and even model structure uncertainty are interpretable in terms of fuzzy sets. A nonmonotonic reasoning approach is supported to allow for the evaluation of simulations based on multiple criteria in different combinations and priorities. 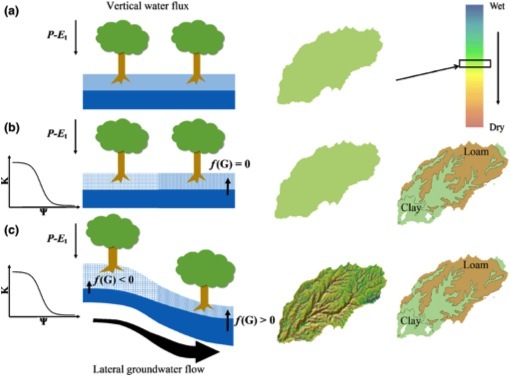 APReS has been applied to simulation of streamflow in forested watersheds, transpiration at hillslope to watershed scales, and to transpiration at individual tree and whole-stand scales. It is currently being used as one of numerous analytical tools for projects funded by NSF and EPA. Long-term water flux changes from converting old-growth pine forests to hardwood forests in northern Wisconsin. NASA, Land Surface Hydrology Program, NAG5-8554, 1999-2003, Mackay (PI). 1. 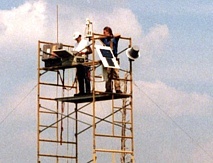 A comprehensive database of vegetation, water fluxes, micrometeorology, remote sensing, soil moisture, tower flux, and process-based models were used in the first successful scaling-up exercise at the WLEF tower (Mackay et al., 2002; Ahl et al., 2004b). 2. An essential bridge was developed between leaf and tower flux measurements with measurements of leaf water potential and transpiration among seven key species in the WLEF tower footprint (Ewers et al., 2002; Ewers et al., 2004). 3. 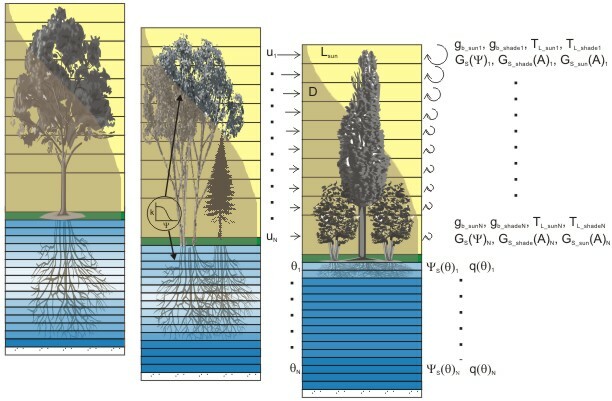 Accurate simulations of transpiration models and parameterization for the heterogeneous forests around WLEF (Mackay et al., 2003a,b; Samanta and Mackay, 2003). 4. We developed a parameterization scheme to use MODIS land surface temperature to estimates canopy stomatal conductance for simulation transpiration and photosynthesis (Mackay et al., 2003c; Mackay et al., 2004). Distributed parameter non-point source pollution modeling in nested watersheds: Guide to implementing legislated surface water quality restrictions in Wisconsin. Hatch/McIntire-Stennis, October 2000 to September 2004, Mackay (PI). Context elicitation to support the semantic integration of environmental models. University of Wisconsin Graduate School Fall Competition, July 2000-June 2001, Mackay (PI). Effects of parameter spatial aggregation on agricultural non-point source pollutions models. US EPA (Pass-through from Wisconsin Department of Natural Resources), 1999-2000, Mackay (PI). Remote sensing teaching and research in support of creating a vision for the environment as a whole. NASA, Centers of Excellence in Remote Sensing, NAG5-6535, 1997-1999, Mackay (PI). Coupling forest ecosystem process-based models to groundwater models: tools to guide natural resource management in northern Wisconsin. Funded by McIntire-Stennis, 1997-2001, Mackay (co-PI) with Gower (PI). Affiliated Research Center (ARC). NASA., Mackay (one of several co-investigators) with Lillesand (PI), 1996-2001. ARCII. NASA, Mackay (one of several co-investigators) with Lillesand (PI), 2001-2006. Scaling spatial simulation of forest disturbance on watershed processes, University of Wisconsin Graduate School Fall Competition, 1997-1998, Mackay (PI). Characterization of evapotranspiration and forest water relations in northern Wisconsin. University of Wisconsin Graduate School Fall Competition, July 2001-June 2002. 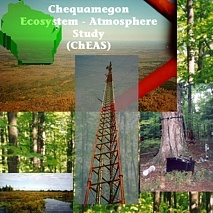 Chequamegon Ecosystem-Atmosphere Study. National Science Foundation, Division of Biological Sciences, Research Collaboration Network Program. Mackay one of several co-investigators with Ken Davis, Penn. State (PI), January 1, 2002 to December 31, 2006. Development and Evaluation of TMDL Planning and Assessment Tools and Processes. USDA CSREES Regional Project DC 00-02, Theo Dillaha, U. Virginia (PI). Mackay, one of two UW-Madison representative, October 1, 2001 to September 30, 2006. 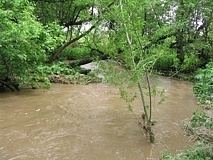 Quantifying non-point source phosphorus losses from field to watershed scales. University of Wisconsin Graduate School Fall Competition, Interdisciplinary, July 2002-June 2003; co-investigator with K.G. Karthikeyan as PI. WebGrant Award. University of Wisconsin Division of Technology instruction web page improvement award.